Super cute candle! The entire candle was wrapped in a white and light blue stitch work kind of pattern and the overall look was so darling to me. See picture above. Doesn’t it look so bright and summery? Sun dried linen. Warm driftwood, sea salt, soft lavender. With essential oils. I’m not usually a fan of linen fragrances (too strong) but what a lovely and fresh scent this turned out to be. I didn’t smell any lavender, but I sure did the sun-dried linen and driftwood. It – sort of, kind of – reminded me of a soft unisex perfume but fresher. Prettier. Whatever it was, I liked it. I lit this candle in my favorite room to burn White Barn candles in – my bedroom. Once the wicks were lit, it took the average 15 minutes to reach a full melt pool and the aroma… a fresh and creamy linen fragrance. I say creamy because it truly did have a creamy quality to it. I sometimes wonder if Bath & Body Works adds a touch of vanilla cream to some of their scents without putting it in the scent description? The aroma drifting through my bedroom smelled like a touch of vanilla, fresh laundered clothes (fabric softener) and a sprinkling of masculine driftwood. I never did smell lavender and I was okay with that. If it was there, it was very subtle. All in all, this was a beautiful and fresh spring/summer scent and one I really enjoyed. Strength – I would rate this candle an 8 out of 10 in a really large room. 10 in a medium to smaller rooms. My favorite part… it wasn’t super strong as some fresh “laundry” type scents can be. This fragrance was smooth and gave a perfect medium throw. This candle burned perfect. No wick issues. Clean burning from beginning to end. YAY!! 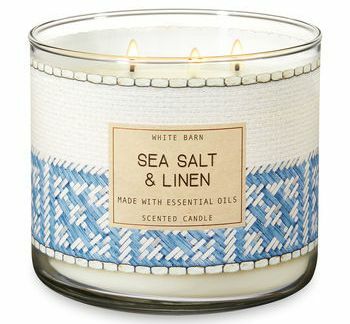 I loved Sea Salt & Linen and am so glad I took a chance and purchased this one to review. It really surprised me. If you love fresh scents, this candle is a must try from White Barn. I typically don’t go for super strong fabric softener type scents but this one wasn’t overbearing at all. I think the added creamy quality I smelled made it a little softer and I was really happy with that. Loved this scent and will for sure pick up another before summer ends. I can’t wait to try this one. It sounds like a scent I would really enjoy especially this time of year!